I took some of my new dry flies for some “dries or die” spins. The size 30 CDC Midge Emerger worked like a charm. Purple got looks, but black received many takes. The Renegade did well sporadically, but, mostly at choppy water. And, smaller fish really liked the “Hi-Viz” Griffith’s Gnat. 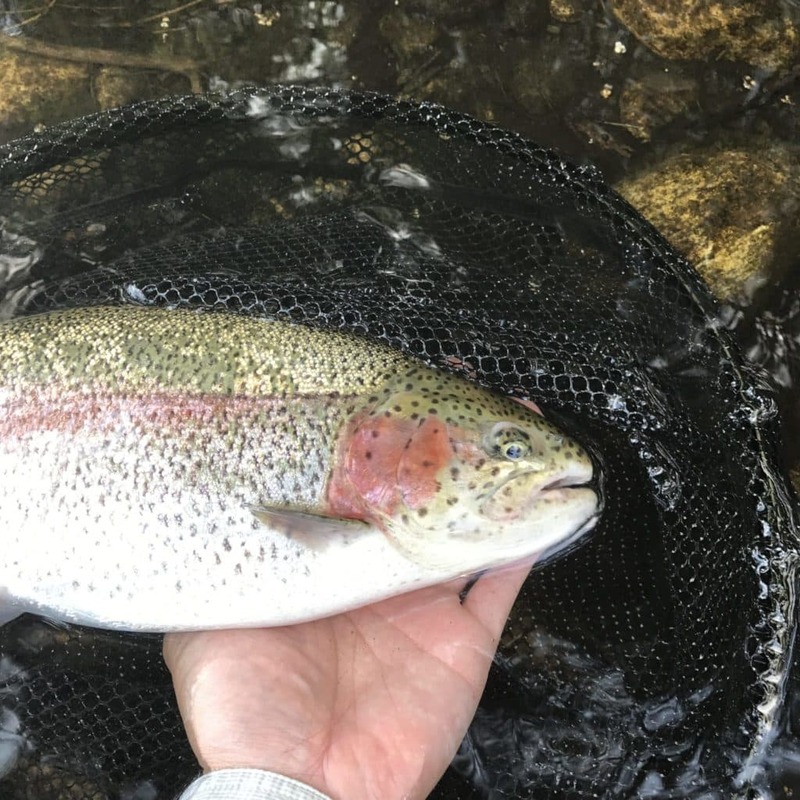 A tough fish to catch was a 14″ rainbow, to which I cast over and over for probably a good 30 minutes. Set the hook too early the first take, but after a few minutes, the fish again sipped bugs. And, I kept at it. Finally, it took a second time. I had a great time catching a load of brookies. They are beautiful and fight their hearts out. The biggest fish thus far for me on a dry is this one. What a fat fish! An online calculator estimates it at 3.1 lbs. A large Elk Hair Caddis duped it. Also memorable was this good-sized brookie that fought a lot harder than it looks. I didn’t measure it, as it jumped out of the net once I unhooked it. Maybe 10″? With the sun bright and the fish educated, it is a great time to get out there. Do you bend the hook to offset the point to increase hooking percentages? How the heck do you tie it onto your tippet?? I assume you weren’t fishing it blind.